We don't usually cover 'Stringbag' sims on BOBGAMEHUB but this is a release we simply can't ignore, because it represents such a long labour of love by a group of dedicated and talented WWI flight enthusiasts. I am not articulate enough to write an in-depth review, but would like to explain to anyone inerested why WOFF is so much fun, at least for me. The graphics are outdated, but crisp and pleasant to the eye. The graphics effects are tasteful, often subtle, never excessive and, most importantly, believable. The scenery is fantastic. I can't comment on the music because I only want the wind and engine roaring in my ears, the hammering of the machine guns, and sometimes, when you are very close, the screams of the enemy pilots going down (another very nice subtle effect, or maybe a figment of my imagination ). The same can be said for the flight models. They are believable, and not so hard to master as to become necessarily the only focus of the game. You can quickly learn the strengths and weaknesses of each a/c and then you are ready to exploit them in combat and try to master the real focus of the game, which is survival in a very unpredictable and harsh environment. Maybe the turn rate of the Sopwith Camel is not 100% accurate, or the climb rate of the Fokker DR1 a little off? I wouldn't really know and honestly couldn't care less. In a word, WOFF is exactly my idea of fun, at least while sitting in front of a PC so let me join the chorus of praises showered on the developers. Well done! It's almost enough to tempt a man away from monoplanes. Some players cite the drawback that it uses the venerable CFS3 platform (heavily modded) and if you don't have it, you need to buy that first, before adding the WOFF content. But this is a simple, automated process and the upside is that WOFF will run nicely with good GFX settings on older rigs. CFS3 is however no longer just a simple click and download deal (and no, we don't support just ripping it off TORRENT). We aren't aware of any sites that sell a digital download, but you can still buy it new on Amazon for about 10 USD or used for half that price. Add in the 60 USD WOFF price and you get a fully fledged WWI flight sim for a very standard price of 70USD. More details from the devs official blurb below. Now a thrilling WW1 experience as the AI pilots possess knowledge of WW1 Fighting maneuvers, Landing, Formation Flying, Ground attacks, Observer/gunner awareness, AI Vision, Dynamic Fatigue, Dynamic Morale, ability to handle Wind and Wind Bumps, and aircraft weight including various loads and more. Controlled by a new WOFF Manager with hundreds of improvements, re-written to produce and control the many brand new AI and Campaign Features. 55 Flyable aircraft included from the start! Includes NEW and improved aircraft. See Aircraft Features. Stunning realistic colored landscapes. See Scenery Features..
Now actual events are tracked more than ever and used within the campaign as discussed some inDev Comments section. New damage controls and methods give more complex damage including fire damage spread,progressive damage, engine and component failures and more. See Dev Comments section. by MATT MILNE, 19 exclusive tracks and also includes the popular theme from previous release. Soon Available to purchase separately. ...and so much more in WOFF please see other features sections.
.: Immersion Labeling system, including DOTS option, Activity and Identity options for immersion.
.: TrackIR - smooth fast implementation.
.: Prop Blur - see the Prop from the Cockpit now.
.: New Flight Training instructor, with flight instructor messages for key events.
.: New Wind and 'air bumps'.
.: Gun Jams and Unjamming. ... and much more you will discover when you fly with Wings: Over Flanders Fields. 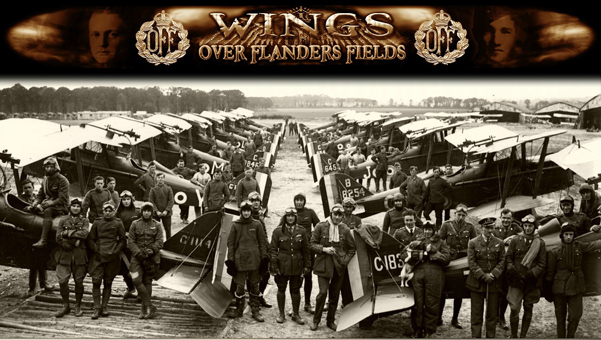 I've been flying OBD Software's Over Flanders Fields for many years and have seen it progress through several releases to the masterpiece it is today. We are luck to have developers in the sim community that have such talent and dedication. I regularly get goosebumps flying WOFF, something I can't say for many other sims. The only single player sims that come close to it in immersion, where you feel that you are taking part in a massive campaign, would be BOB II or Falcon.